Zheng Xing - Happy & Joyful! 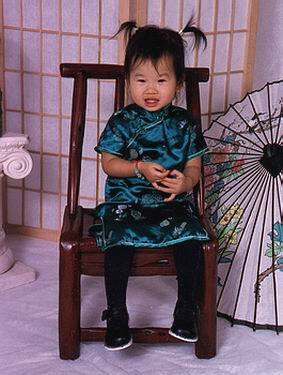 We are a couple in Ohio who have the great fortune to have adopted a daughter from China. After much thought and discussion, we put pen to paper in January of 1999 and began an adventure that culminated in flying to meet our daughter in March of 2000. Click here for some information about Nanning, the capital of Guangxi, where we first met Delainie and close to where she was found. 2001-03-13: At long last, I've finally typed up the notes from the China trip. I'm not 100% certain of the placement of something items, but I'm glad that it is at last on the web. You can either click here or on "Our Journey" on the left side for the travel pages. What is our Adoption Agency? is owned by Michael A. & Tammy G. Hendershot. This site is not currently in the webring.